Small Kukri +1/Masterwork Small Kukri +1 +12/+12 1d3+1/1d3+1 Slashing/Slashing 18-20/x2/18-20/x2 Melee/Melee. Small Dagger +12 1d3 Slashing or Piercing 19-20/x2 Melee/20 ft.
Masterwork Small Longbow +13 1d6 Piercing ×3 150 ft.
Masterwork Small Longbow (Barbed Arrows) +13 1d6 Piercing 19-20/x2 150 ft.
REP purchased - Weapon Finesse: With a light weapon, rapier, whip, or spiked chain made for a creature of your size category, you may use your Dexterity modifier instead of your Strength modifier on attack rolls. If you carry a shield, its armor check penalty applies to your attack rolls. Level 3 - Weapon Focus (Kukri): Choose one type of weapon, such as greataxe. You are especially good at using this weapon. You can choose "unarmed strike" or "grapple" for your weapon for purposes of this feat. If you are a spellcaster, you can choose "ray," in which case you are especially good with rays, such as the one produced by the ray of frost spell. REP purchased - Two Weapon Fighting: You can fight with a weapon in each hand. You can make one attack each round with the second weapon. Level 6 - Far Shot: You can get greater distance out of a ranged weapon. Rogues share little in common with each other. Some are stealthy thieves. Others are silver-tongued tricksters. Still others are scouts, infiltrators, spies, diplomats, or thugs. What they share is versatility, adaptability, and resourcefulness. In general, rogues are skilled in getting what others don't want them to get: entrance into a locked treasure vault, safe passage past a deadly trap, secret battle plans, a guard's trust, or some random person's pocket money. Charging Smite (Su): Beginning at 5th level, if you smite evil on a charge attack, you deal an extra 2 points of damage per paladin level to any evil creature you hit. (In addition to the normal bonus damage dealt by a smite). If the charge attack misses, the smite ability is not considered used. This group includes chipmunks, mice, rabbits, and squirrels, among others. -Small-size: A small rodent or lapid gains a +1 size bonus to Armor Class, a +1 size bonus on attack rolls, and a +4 size bonus on Hide checks, but also uses smaller weapons than humans use, and lifting and carrying limits are three-quarters of those of a Medium character. -Light Build: Thanks to their slighter builds and more agile bodies, beastfolk with light build can use weapons and armor designed for creatures one size smaller without penalty, and can fit through tight spaces as though they were one size category smaller. Despite these advantages, those with light build count as their normal racial size for determining space and reach. This ability stacks with powers, abilities, and spells that affect size category. -Frantic Scurry: When running, small rodents and lapids can move five times their normal speed if wearing medium, light, or no armor and carrying no more than a medium load, or four times their speed if wearing heavy armor or carrying a heavy load. If they make a jump after a running start (see the Jump skill description), they gain a +4 bonus on the Jump check. While running, they retain their Dexterity bonus to AC. This stacks with the Run feat, increasing each modifier by one (x5 run speed becomes x6 and x4 run speed becomes x5). -Keen Hearing: +2 to all Listen checks. -Variable Movement Types: A small rodent or lapid may choose to gain a +2 racial bonus to two of either Climb, Jump, or Move Silently, chosen at character creation. Mice and chipmunks generally take Climb and Move Silently, rabbits Jump and Move Silently, and squirrels Climb and Jump. 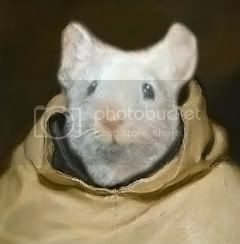 A short yet slender figure, no taller than a Gnome or a Halfling, Gram shows the hallmarks of the archetypal Mouseling; large ears protruding from the sides of his head, perking upwards as a set of wide dark-orbed eyes add to a visage of cautious curiosity, a pink button nose tips the rodent's whiskered snout atop a small thin mouth with an unassuming expression, small pinkish clawed hands with long thin digits clasp together out of habit, while Gram stands on similarly pinkish feet, though longer and larger, well suited for a rodent's scurry. A long wormy tail pokes out from beneath the back of Gram's Garb, laying docile on the ground with the odd twitch or swish, such as the tails of beastfolk are. The Mouseling's dress formed from a dusty yellowish priestly robe, patterning with his glistening white fur to form the colors of Sol Invictus, whom the Paladin Mouse follows, around his neck dangles a golden sun disc, the holy symbol of the Morninglord. On a closer look, the patches fur on Gram's arms appear to be shorter and uneven than those on the rest of his body, this is due to a peculiar mannerism apparent in Mouselings that Gram has picked up, see below. Gram, as expected, is a soft-spoken sort of person, though being a Paladin means that one must be eloquent in certain matters of discussion, for the most part, the little Mouseling prefers efficiently participating in as little syllables as possible. Behaviorally though, the Mouseling exhibits a wide range of reactions, the position of his ears and tail telling marks of Gram's mood, laying back and shaking respectively in moments of distress or nervousness. Gram has developed the habit of "Barberism", common among mouselings and while somewhat unrelated to the general level of culture he maintains, it means that he has the habit of nibbling away patches of fur when nervous, similar to nail biting in Humans, though he tries not to exhibit this behavior in front of non-Micefolk, as he understands that it may not seem too socially acceptable. Gram was born in the Southern Avalon Wharf District, quite a distance away from Avalon proper and nestled amongst the swaths of downtrodden slums, though the commerce passing through Avalon's southern ports meant that the wharf and the main roads were better guarded by the Avalon Watch, it was still just below any place in Avalon's Midtown.